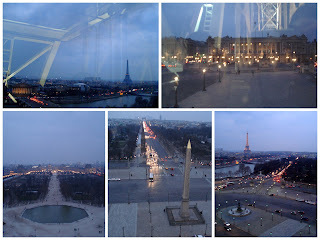 Seeing the city of lights from the ferris wheel (la grande roue) at Place de la Concorde. We'd been meaning to go to this ferris wheel for weeks - if not months. Christmas-time seemed too busy, and then we had to keep postponing the trip for various mundane reasons. For instance: T begged to go when we went to the Louvre and Tuileries earlier this month (that's when the below photo was taken), but I could see she was tired and didn't want to push my luck with her on what had been a pretty god day. It was initially supposed to be taken down in late January, so we're pretty lucky we still got a chance to go up at all. We went as a group of four: T, sister 4, and I picked up my mother from work for the occasion. My mother had thought twilight would be best, and it proved a great time to go: when we went up it was still pretty light outside, but as we continued to go 'round the streetlights were switched on and we left at dusk. There was no line at all (most gondolas were empty), and though it was freezing it was absolutely worth it. The fees are pretty hefty: €10 per adult and €5 for under 10s. A ride involves three relatively quick rotations, but Sister 4 and T pleaded with the operator to go again - and he relented at their "see voo play!" (business was slow, and the kids are pretty cute). As the photos show, the ride gives a pretty good view of central Paris - especially down the Champs Elysees (the Arc the Triomphe is way in the back), Louvre and Tuileries, and of course the Eiffel Tower. I'm not sure if the Parisians would tolerate a permanent London Eye-like attraction in their city center, but despite not being a fan of heights I really enjoyed it. T was squealing with delight, and that attitude is pretty contagious.